BUFFALO, N.Y. (CNS) — Catholic journalists could easily “remain on the surface” when reporting on Pope Francis with his great photo opportunities and “buzz-catching expressions,” but they need to take their coverage a step further, said Basilian Father Thomas Rosica. “Our work as Catholic media is not to remain on the surface but to go to the deeper level of that story within the story,” urged the priest, founding CEO of Canada’s Salt and Light Catholic Media Foundation. 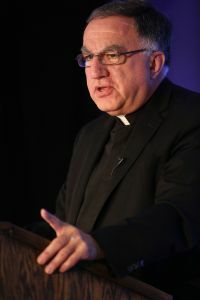 Father Rosica was the keynote speaker June 26 at the Catholic Media Conference in Buffalo. He also was the recipient of the Clarion Award from the Catholic Academy of Communication Professionals, presented June 25 at the organization’s Gabriel Awards banquet. The award recognizes creativity, excellence and leadership in communications and ecumenical cooperation. The priest, born in Rochester, got his journalism start by writing a weekly section of the Courier-Journal daily newspaper about Catholic school events. In his address, he told Catholic media representatives about the pope’s recent headline-making comments about how he doesn’t watch television, have a laptop or an iPhone. Those remarks are not the end of the story though and Father Rosica said they shouldn’t suggest the pope has no interest in modern technology. Another key aspect of the pope’s ministry — his calling together of the Synod of Bishops on the family last October — was also reduced to sound bites, that at times were inaccurate, the priest said. The priest urged journalists to read the text of the pope’s closing address at the synod, which he said confirms the “story within the story” of the synod’s achievement. He also disagreed with those who argue that the pope has no authority to speak on this issue, stressing that it builds on Catholic social teaching. He also noted that when journalists report on the encyclical, they need to present the “full picture” of the document which calls for a response to the cry of the earth and the poor. The church can live out mercy when parishes reflect the image of church as “field hospital” that Pope Francis has used, but such work also can be done by members of the Catholic media, he added. “Be sure to tell that story to the world,” he told them.